By Marcus Richardson: Fighting at home, WBO light middleweight champion Zaurbek Baysangurov (28-1, 20 KO’s) defeated WBO interim light middleweight champion Lukas Konecny (48-4, 23 KO’s) last Saturday night at the Sport Palace, in Kiev, Ukraine. The final judges’ scores were 119-109, 117-111 and 118-110. You can make a strong argument that Konecny deserved to win the fight, not the 27-year-old Baysangurov. Konecny landed the much cleaner shots and the harder shots in pretty much round of the fight. The crowd, however, was in Baysangurov’s favor the entire time, and cheered each time he would land a light shot. His power was considerably lesser than Konecyny’s and there was long stretches of the fight where Konecny was landing all the good shots, whereas Baysangurov was just throwing weak jabs that looks more like arm punches than quality jabs. Konecny really worked Baysangurov over with huge shots for the first eight rounds of the fight. The crowd was completely silent when Baysangurov was getting tagged. However, when he’d finally offer up a light punch, the crowd would go crazy as if he landed a huge shot. The fact is Konecny was the only one landing with any power in this fight, yet he was completely ignored by the crowd. Overall, I’d say this was a poorly scored fight. I felt Konecny easily won the fight based on his better his harder and better landing shots. If you were one of the boxing fans who felt that Manny Pacquiao deserved to get the win in his last fight against Tim Bradley they you’d like agree that Konecny deserved the win in this fight because it was a very similar type of fight. 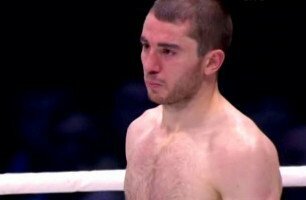 Baysangurov landed the weaker shots, whereas Konecny would erupt with monstrous punches that were completely ignored by the crowd. Konecny was up against it coming into Kiev for this fight, and perhaps needed a sensational effort in order to get the win.